As a teacher, it's very rewarding to be acknowledged for your efforts. (And who doesn't love a trophy?!) It's also great for students to be recognised for their hard work, too! Below are some of my achievements as an educator and some of the achievements of my students and the ensembles I have tutored/conducted. 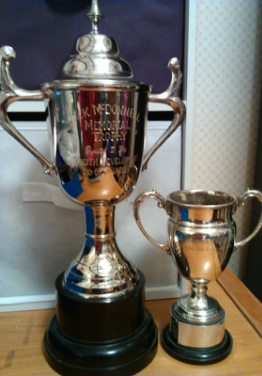 Me: awarded the 2013 and 2014 Auckland Brass Bands Association "Conductor's Cup" (For conducting the band with the most points awarded in the solo /party contest.) This was open to all bands and all grades (Including the adult categories). Me: awarded the Auckland Brass Bands Association "Youth Development Co-ordinator" cup, in recognition of my work promoting youth in brass bands. Me: have entered over 50 students in exams in both Australia and New Zealand and I have a 100% successful pass rate. My students' results in ABRSM (the exam board I have used the most) are well above the NZ national and the international average. No Strings Attached: Awarded "Most engaging performance" at the 2013 Chamber Music New Zealand Secondary Schools Contest - Auckland Heats (Out of 106 entries). (I was their tutor). Have had 2 french horn students (in different years) selected to perform a solo item at the Auckland Primary Principal's Association concert at the Auckland Town Hall. A trumpet student was runner up in their whole school music solo contest. Eligibility up to 17. They were 12. A horn student attained "Excellence" in their NCEA level 3 solo performance exam, after switching from trumpet to horn only 3 months prior. A 12 year old horn student was invited to perform in the horn section with the Auckland Youth Orchestra in 2013. The other horns were aged 16-21.